It appears the data I have on sleep quality and cognition aren’t showing an association. At least not one strong enough that’ll qualify the paper for print. I think it’s pretty lame that a lack of association will keep a paper from print. Journals should also be willing to print papers that show no association. These papers have just as much value, in my opinion. What that means for me is that I may not have a paper. My mentor has requested another analysis from the statistician. If that shows an association, then I can move forward. If not, I’m working on some alternative hypotheses. I spent the majority of yesterday doing that. Most of the background doesn’t look too promising as potential support for an argument or I’m having trouble locating full articles. It’s almost like starting all over. A friend likened it to writing an article for the paper and then it falling through after half the story is written — times 100. That’s exactly like it. Oh, well. It happens. Categories: General | Tags: farmworkers, health, projects, public health, research, writing | Permalink. Hello! Popping in to give a quick update. I do have a couple more Small Travels and Musings posts about state parks, but those have been put on hold for a week or so. I’ve got a few things I’m working on and those take priority. Sorry! Not that y’all aren’t important or anything. Though I haven’t posted here, I have been a busy bee writing essays for applications, a paper prospectus and, now, my paper. I’ve been interning at a local medical school since June, which includes reading background information on various topics. For my project, I selected how sleep quality affects cognition, specifically Hispanic farmworkers and manual laborers. A statistician has started analyzing the data and has begun turning out some numbers, which I’ve started to look over. Did your jaw drop? Mine does every time I read the first few facts. Appalling. I included the last bit of information because I’m looking at sleep and I thought you’d find it interesting, too. It’s really exciting to think of changes that could occur as a result of such research. Imagine what good could be accomplished with some elbow grease and cooperation. Hansen, Eric and Martin Donohoe. “Health Issues of Migrant and Seasonal Farmworkers.” Journal of Health Care for the Poor and Underserved (2003). 14(2): 153-164. Patel, Nirav P. et al. “Sleep disparity in the population: poor sleep quality is strongly associated with poverty and ethnicity.” BMC Public Health (2010). 10: 475. Categories: General, Small Travels and Musings | Tags: farmworkers, health, projects, public health, research, writing | Permalink. Yes, she made these! She has some awesome talent. She is also a very creative lady. We have several more meetings planned in the coming weeks. Right now we have 31 cards made and I hope we can make at least 3x as many before Christmas. Our goal is to deliver cards to three nursing homes this year. In the past we only visited one so we’ve taken on quite a challenge to make sure we have enough cards made in time. Categories: Beth's Crafty Things | Tags: cards, Christmas, Crafters for Christ, craftivism, papercrafts, projects | Permalink. As flurries fell outside, I sat in the kitchen this afternoon and finished up two more walker/wheelchair bags. Yep, I sat at the kitchen table. No more freezing in the cold basement for me! You’ll recognize the bag on the left from this post. I finally got around to sewing the front, back and straps together. 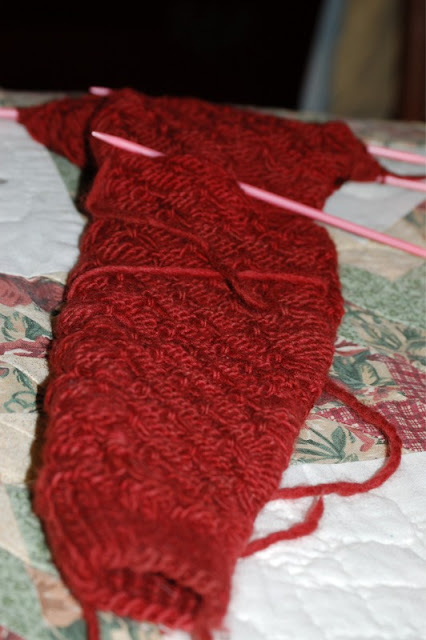 For the second bag, I used remnant material that my friend, Dahna, gave to me. I think it makes a very nice bag and I can’t wait to hand it to a nursing home resident! I used my new rotary cutter and cutting mat (thanks, again, to my parents!) to cut out the second bag and I loved how everything came out more evenly and how the size of the straps are better proportional to the bag. I asked for the rotary cutter and mat after Rae of Made by Rae said she likes using a mat so that the fabric lies flat and she can cut straighter lines (at least I think it was her who said that). Since the straps are narrower, I only used one Velcro square. The smaller bag has wider straps, so, therefore, I had to use more Velcro. What do you think? I bet nursing home residents will be very happy to receive these! Right now, besides blogging, I’m curled up on the couch, sipping hot cocoa my sweet hubby made and am about to start studying some precal and physiology. Categories: Beth's Crafty Things | Tags: Brother sewing machine, craftivism, projects, purses, sewing, wheelchair walker bags | Permalink. I just finished a pair of pj shorts for Chris this afternoon. It felt great to finish a project and have something to show you. I have much more of this fabric and plan to make me a pair of pj bottoms, too. That’s actually next on my list, as well as, a shirt for me. And, weeks after buying them, I finally got around to hemming two pairs of jeans for Chris. We bought them at Ross Dress for Less (my favorite store!) for about 20 bucks or so. Usually we have a hard time locating some good prices on jeans for Chris, so, though they were too long, I encouraged him to get them if he liked them. But then I forgot about them. Oops! And, a quick update. I’ve returned to the classroom! As you’ve probably noticed, a lot of my personal obligations have fallen by the wayside. It’s been a big adjustment, but I’m excited for the opportunity and glad that I can concentrate on this full time. So, I can’t promise I’ll post weekly, but I’ll post when I can. Sharing my projects and recipes are still very important to me, but I’ve had some major changes in my routine and it’s been a lot to get used to. 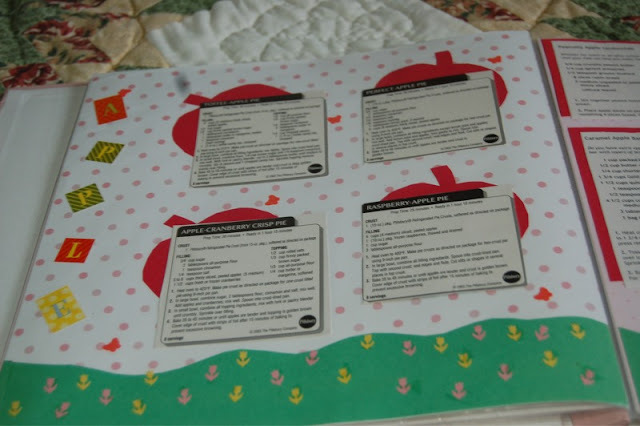 Categories: Beth's Crafty Things | Tags: life, projects, school, sewing, shorts | Permalink. I just finished my second scrapbook! 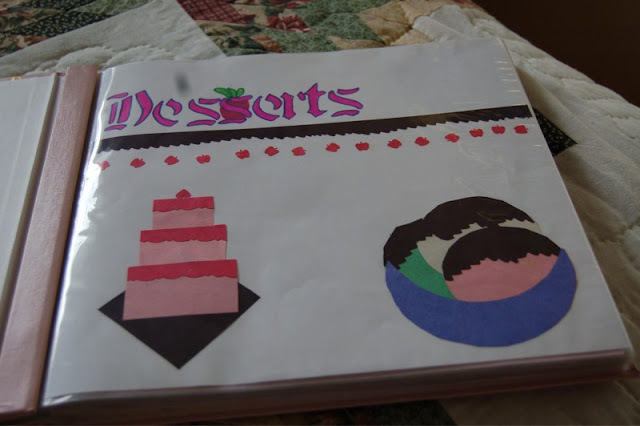 I started this scrapbook of desserts a few years ago when I first started scrapping. 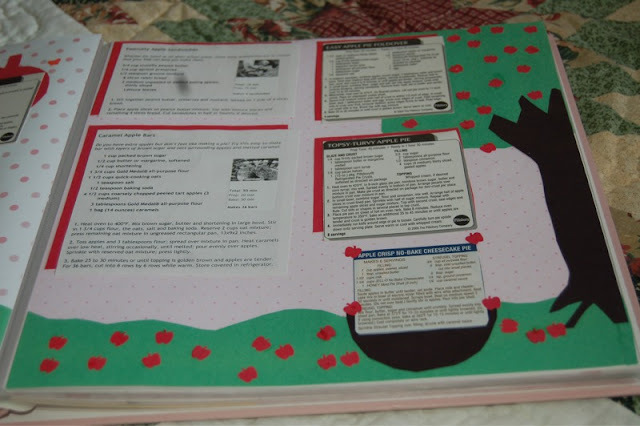 In it I’ve placed all the dessert-related recipes I’ve collected over the years, including family recipes. I had bits of pages and papers sitting in piles and in bags, getting wrinkled and torn. I figured if I were to ever use these treasures I better organize them for easy use and safe storage. I’ve got plans for scrapbooks to house appetizers, drinks, soups and breakfast; beef and pork; and chicken and fish. But those books will probably be smaller than a 12″ by 12″ book. 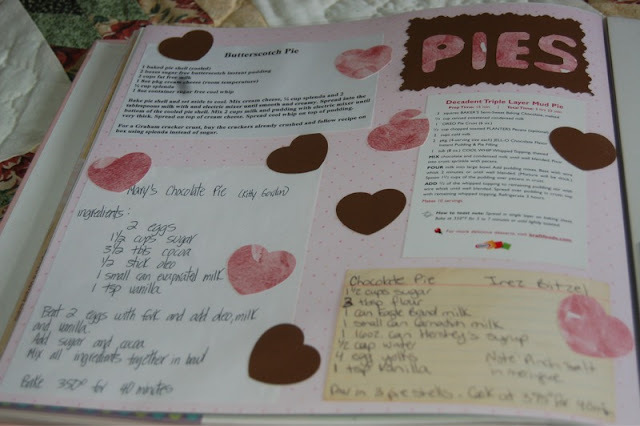 The dessert book won’t fit in the closet with the other cookbooks! I could attribute that to poor planning, though I think the cookbooks were upstairs in our attic loft when I started this book. Oops! Oh, well. The book has currently found a home on a shelf on our small TV table. Here’s a few of my favorite pages. Please excuse the dark spot on the pics. I can’t seem to get my Nikon cleaned. I think it’s time to get the body professionally cleaned. Oh, and get a new lens. After months of the glass falling out, the old wide angle finally fell apart this morning! First page of an apple-themed spread. Second page of the apple-themed spread! 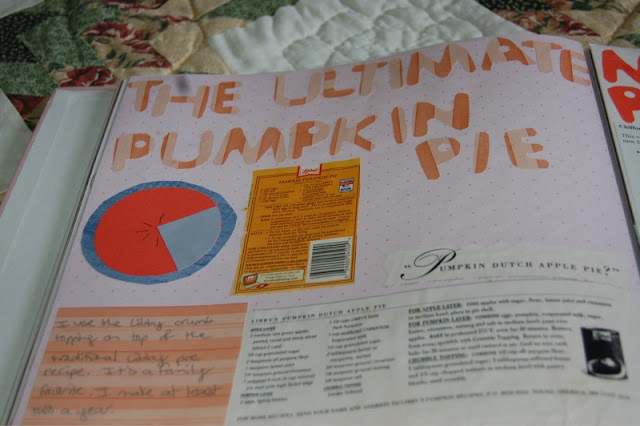 This page has the pumpkin pie I make nearly every year. My family loves it and requests it often. Pies, pies, all kinds of pies! Next up will probably be our wedding album. 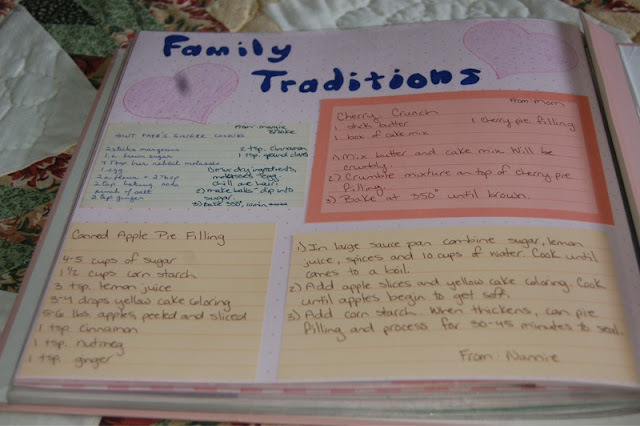 I don’t have books for the other recipe books yet, but the wedding album is ready to go with photos, paper and mementos. Categories: Beth's Crafty Things | Tags: crafts, food, projects, recipes, scrapbooking | Permalink.